Rent Emerald at Queensridge | Corporate Events | Wedding Locations, Event Spaces and Party Venues. Emerald at Queensridge is a premier venue that offers a non-gaming off the Strip venue that is neither a hotel, nor a private country club. 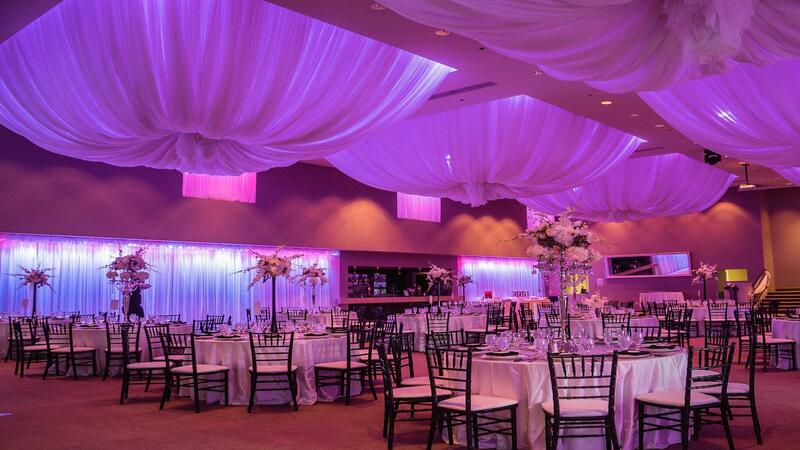 This exquisite, single-event facility is ideal for holiday parties, birthday bashes, luncheons, awards banquets, and specializes in weddings and receptions. Emerald at Queensridge provides multiple ceremony options. Our lavishly landscaped courtyard, surrounded by tranquil waterscapes and magnificent views of Red Rock Canyon, provide the perfect setting for romantic outdoor ceremonies. Our climate controlled exquisite Grand Ballroom provides a wonderful alternative for beautiful indoor ceremonies. Words alone cannot convey the elegance and grandeur of our reception ballroom, which features a grand staircase, dramatic vaulted ceilings, spacious inset mahogany dance floor, custom granite bar, and state-of-the-art audio/visual equipment. Suitable for 50-350 guests, the ambiance of the Ballroom is enhanced by our controlled lighting and custom decor, enabling your guests to dine in accordance with your every whim as they dance the night away. The completion of our brand new, state-of-the-art gourmet kitchen enables our Executive Chef to prepare virtually any meal in house for your special event. In addition, we are able to customize a menu to accommodate your preference.